Tonight is the deadline for teams to set their 40-man roster for next month’s Rule 5 Draft and the Yankees announced just one one roster addition: Joe Harvey, a right-handed reliever. There are now 39 players on the 40-man roster. The deadline is 8pm ET, so more moves could be on the way. Similar to Dietrich Enns back in the day, Harvey had Tommy John surgery early in his pro career and has been untouchable since returning. He had elbow reconstruction in June 2015 and, since returning in July 2016, he’s thrown 106.1 minor league innings with a 1.35 ERA (2.81 FIP) and 27.7% strikeouts. How about that? I imagine he’ll be a shuttle bullpener in 2019. The Yankees didn’t have many notable Rule 5 Draft eligible prospects this offseason. 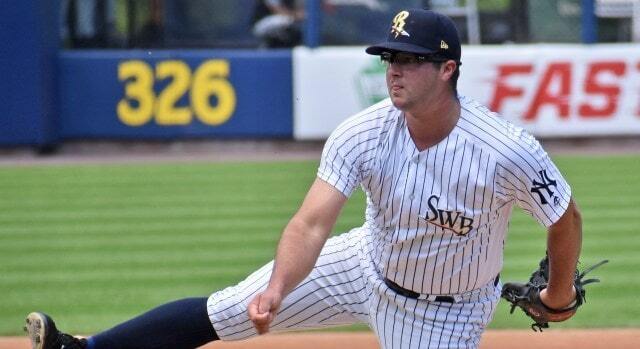 Chance Adams and Stephen Tarpley (and Justus Sheffield) were added to the 40-man roster during the season and Rule 5 Draft eligible guys like Erik Swanson, Dillon Tate, Josh Rogers, Abi Avelino, and Cody Carroll were traded away in recent weeks and months. Among the notable players the Yankees are leaving exposed to the Rule 5 Draft are righties Raynel Espinal and Nick Green, lefties Nestor Cortes and James Reeves, and infielders Kyle Holder and Brandon Wagner. I thought Holder would get protected. Shows what I know. Cortes, Espinal, and Reeves stand the best chance of getting picked, I think. As a reminder, players selected in the Rule 5 Draft must remain on their new team’s 25-man active big league roster all next season, or be placed on waivers and offered back to their original organization. Ten different players were selected from the Yankees in the last three Rule 5 Drafts and only one, catcher Luis Torrens with the Padres, has stuck. The Yankees have an open 40-man roster spot and that would allow them to make a Rule 5 Draft pick themselves — they haven’t made a pick in years — but I’d bet against it. They’re still looking to add a starter, a Didi Gregorius replacement, and some bullpen help this offseason. That open 40-man spot will likely be put to use there.